Photograph courtesy Steve Marshall. 25076 at Haymarket station with the 12.25 Edinburgh - Dundee on December 18th (or 19th?) 1981. The twenty one year two month career of D5226/25076 was split between allocations to London Midland & Scottish Region depots. Royal Train cabling modification (cab front access panel). Dual brake equipped (October 1978). Angled strip at bottom of cab doors (October 1978). Time between withdrawal & scrapping: 19 months. March 1964 to Derby (16C). June 1964 to Saltley (2E). February 1968 to Nottingham Division (D16). October 1968 to London Division (D01). December 1968 to Nottingham Division (D16). After withdrawal 25076 was stored at Bescot from November 1984 until moved (see details below) to Swindon Works on March 27th 1985 and scrapped by the middle of August 1986. The cabs were transported to Vic Berry, Leicester and later disposed of. Noted Derby Works September & November 1964. Noted Derby Works August 1965. Noted Derby Works March 1967. Noted Derby Works April 1970. Noted Derby Works April & August 1974. Noted Crewe Works January 1975. Noted Glasgow Works June & October 1978 (dual brakes fitted). Noted Glasgow Works October 1981 (N1 repairs). 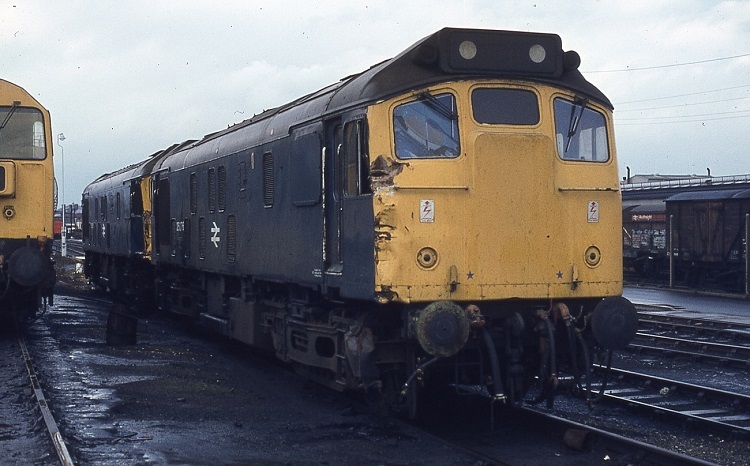 Noted Derby Works December 1982 & January 1983 (N1 & collision damage repairs). 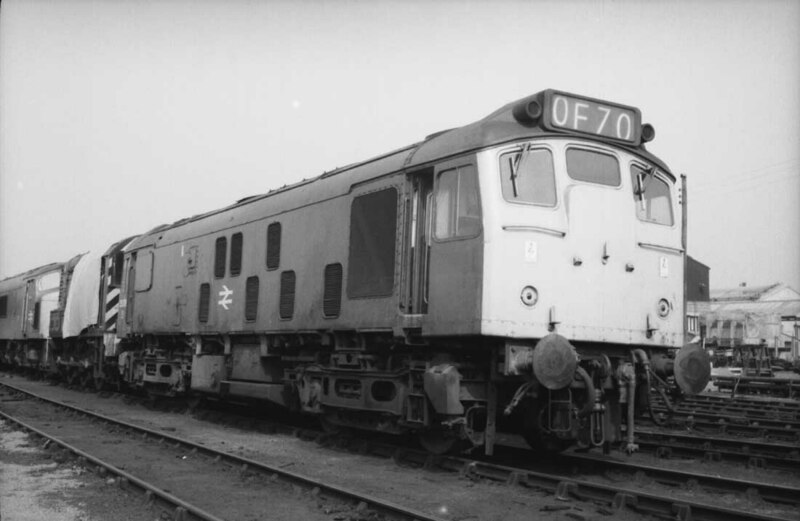 An early passenger working for D5226 took place on August 14th 1964 working the 11.28 Peterborough - Edinburgh with nine bogies from York to Newcastle, it had replaced 60146 and was itself replaced by 60129 at Newcastle, where arrival was eleven minutes late. A very short working on April 3rd 1965 saw D5226 working a Birmingham Snow Hill - Swindon charter between Kings Norton & Birmingham New Street. On May 9th (or 11th?) St Pancras was host to the Royal Train which was booked to leave at 22.30 to Nottingham via Manton, hauled by D5223 & D5226. The next day (10th) D5223 & D5226 hauled the same train from Worksop to Matlock via Chesterfield. Later the same day Royal train headed south being noted passing through Banbury. On September 9th D5226 worked the roundtrip Nottingham - Llandudno Town. The Duke of Edinburgh’s visit to the Yorkshire area on June 26th utilised a four coach train hauled by ‘Royal Regulars’ 5226 & 5223 from Moston. Condition July: blue/yellow livery, BR emblems on each cabside and two numbers on each bodyside with 'D' prefixes, gangway doors in place, Royal Train cabling modification (cab front access panel), this modification most likely did not survive the next Works visit for 25076. A Derby (Nottingham?) - Brighton day excursion on February 6th was worked (roundtrip?) to Cricklewood by 5226 & 7558. On April 16th 5226 worked a later afternoon/evening Leicester - Peterborough roundtrip. The Midland mainline produced two services for 5226 & 5233 on June 12th (or 16th? ), working the 14.10 Sheffield - St. Pancras and the 17.57 St. Pancras - Nottingham. Unusual sightings on December 7th included Toton based 5226 working a Skipton – Hartlepool freight. On April 16th 5226 was noted at Nottingham in two-tone green livery with full yellow cab fronts. A Derby - Skegness roundtrip was worked by 5226 & 5268 on July 9th 1972. On October 21st 1972 a Euston - Aberystwyth day excursion was worked roundtrip from/to Wolverhampton by 5226 & 5237. A passenger working late in 1973 saw 5226 on November 25th work the 20.43 Birmingham New Street - Leicester. Late in February 1974 (maybe 25th) 5226 & 5220 worked the 07.30 Birmingham New Street - Leeds and the 12.38 Leeds - Birmingham New Street. Near the end of the 1975 summer season on September 13th 25076 & 25120 worked a roundtrip Leicester - Skegness. 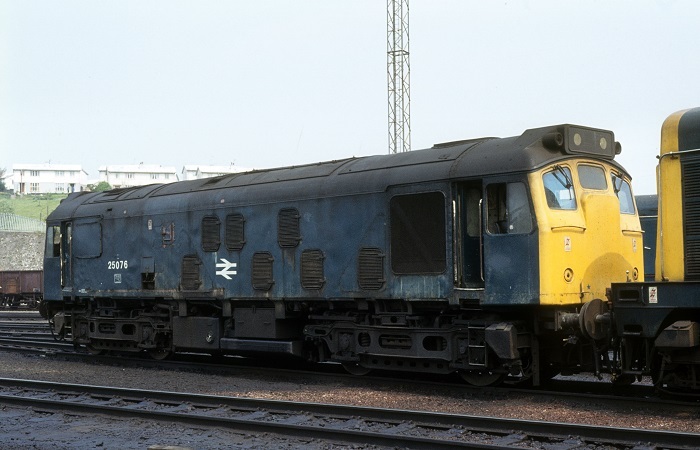 Photograph collection of webmaster 25076 at Derby Works during April 1974. Towards the end of March a strike by supervisory staff at depots and workshops quickly affected availability of stock. This took a severe toll on many of the extras planned for the Easter period, those and many regular services that did run featured misplaced stock & locomotives. On April 1st 25076 was noted heading north through Cheshunt with a freight working. 1976 produced a variety of seaside workings starting on April 17th with an Alfreton & Mansfield Parkway - Yarmouth day excursion worked by 25076 & 25218 (roundtrip presumed and throughout to Yarmouth). Two days later (19th) a less successful relief trip from Alfreton & Mansfield Parkway to Skegness took place with 25076 and an unidentified Class 25 only managing the outward leg, the poorly Class 25s were replaced by a Class 47 on the return leg. 25076 with 25095 returned to Skegness on May 30th on a roundtrip from Leicester. On June 3rd 25076 & 25239 worked the roundtrip 'The Jolly Fisherman' to Skegness. 25076 & 25125 worked the Derby - Norwich - Yarmouth - Norwich - Walsall diagram on July 17th. A Burton on Trent - Blackpool North roundtrip day excursion was worked by 25076 & 25075 on October 2nd. On a wet and miserable February 23rd the Nottingham Divisional S & T Engineer undertook one of his periodic inspections. The inspection saloon was in charge of 25076, with the steam heat boiler working and was noted traversing the Duffield – Wirksworth. On April 9th 25076 was noted at Edinburgh Waverley with a short train which included Track Testing vehicle DW139. On April 11th a Burton on Trent - Skegness day excursion was worked out & back by 25076 & 25074. During May 25076 was transferred to Haymarket and was quickly used on the 07.05 Perth - Edinburgh on May 17th and the 21.40 Edinburgh - Carstairs on May 27th. The 21.10 Bristol Temple Meads - Edinburgh was worked from Carstairs by 25076 on August 2nd 1977. On August 21st 1977 25076 & 25086 worked the 23.20 Glasgow Queen Street - Inverness to Perth. The Highland mainline was visited on September 6th 1977 with 25076 & 26028 working the 16.40 Inverness - Edinburgh and the 23.05 Edinburgh - Inverness. On October 27th 1977 25076 started out with the 11.00 Stranraer Harbour - Carlisle but failed en-route at ? ?, being rescued by 20125 with a thirty five minute late arrival. 25076 heads a line up of locomotives at Glasgow Works on June 29th 1978. The 14.44 Glasgow - Perth (or Dundee?) was worked by 25076 on April 14th. Two weeks later on April 28th 27022 failed just after departing from Tyndrum Upper with the 16.37 Glasgow Queen Street - Mallaig. The signalman ran the driver down to the timber sidings at Cranlarich in his car where 25076 was stabled. The Class 25 was used to assist the service forward. The workings for 1979 include the Glasgow Queen Street - Dundee annd Edinburgh - Perth services. On September 30th the 04.20 Mossend Yard - Glasgow Queen Street was worked to Cowlairs Junction by 25076 being the portion off the 1S07 Euston - Inverness. The next day (October 1st) 25076 worked the 21.50 Euston - Fort William from Mossend Yard to Cowlairs Junction. On October 27th 25076 failed at New Cumnock whilst working the 13.40 Glasgow Central - Carlisle, it was replaced by 25013, the service now running about an hour late. 27024 dragged the failed 25076 back to Ayr depot. On June 7th the 14.44 Glasgow Queen Street - Dundee and 17.33 return were worked by 25076. The 17.25 Glasgow Central - Stranraer Harbour was handled by 25076 & 27012 on July 11th. The next day (12th) the same pair worked the 01.20 Stranraer Harbour - Blackpool North to Carlisle, returning from there with the 09.43 Blackpool North - Stranraer Harbour, a round trip of 332 miles. Finally on November 12th 25076 worked the 10.44 Glasgow Queen Street - Dundee (26027 worked the return leg). 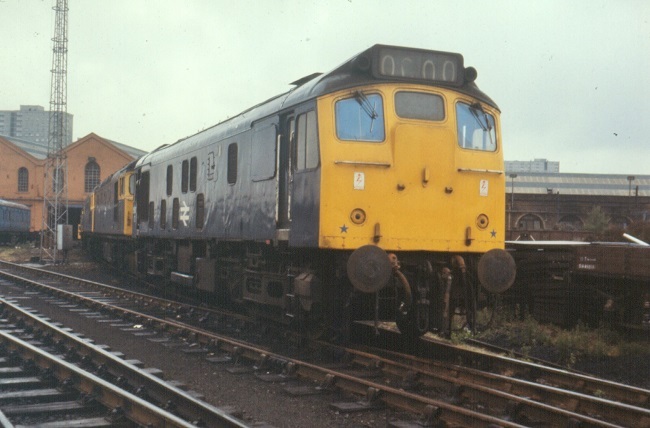 Railtour duty took place on April 25th, 'The Palatine' from Euston to Buxton was worked forward from Coventry to Bescot Yard by 25076 & 25033 where the locomotives were failed and replaced by 25129 & 25130. Back in Scotland, 25076 worked the 12.51 Edinburgh - Perth on June 17th, and a month later on July 21st 25076 & 26043 worked the 15.40 Edinburgh - Inverness. On August 7th the 05.55 Stirling - Edinburgh was worked. After a gap of some considerable time Glasgow Works received a Class 25 for minor repairs, 25076 arrived at the beginning of October for attention to the power unit. On December 9th it was the turn of the 13.55 Aberdeen - Inverness for 25076. The 12.25 Edinburgh - Dundee was handled by 25076 on December 19th and the 12.40 Glasgow Central - Carlisle on December 28th. 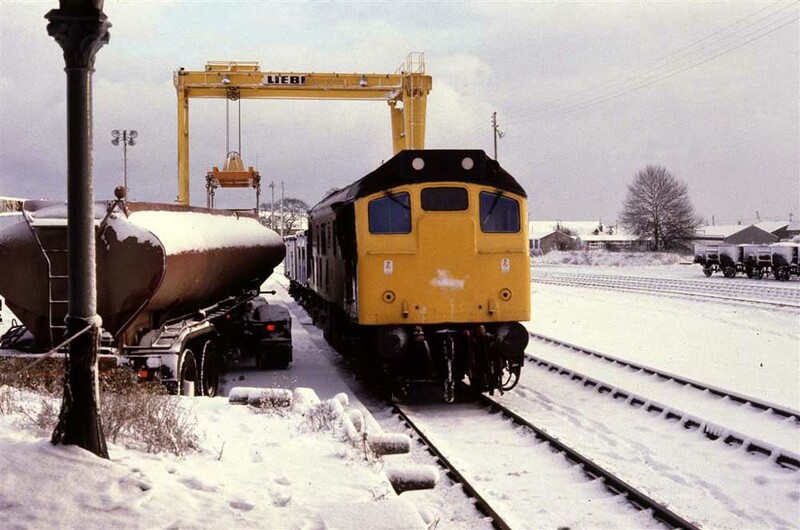 Photograph courtesy Norman Smart An atmospheric view of 25076 at Elgin yard during the winter of 1981. February 22nd saw 25076 work the 16.32 Carstairs - Edinburgh, being the portion off 12.08 Birmingham - Glasgow followed by the 18.10 Edinburgh - Liverpool to Carstairs. On February 25th the 14.20 Dundee - Edinburgh was worked. 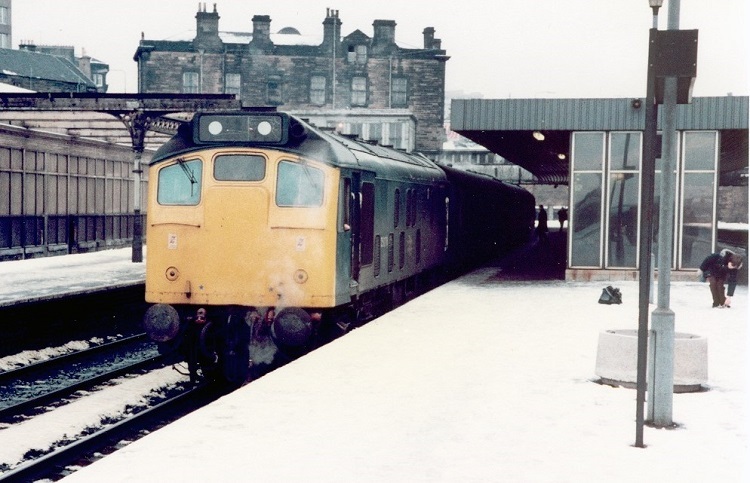 On March 10th 25076 worked the 14.43 Inverness - Aberdeen followed the next day (11th) by the 11.05 Perth - Edinburgh, the 12.51 Edinburgh - Perth, the 17.12 Perth - Arbroath and the 18.33 Arbroath - Dundee. On March 15th 25076 worked the 10.14 Perth - Motherwell with 26028. Finally in March the 12.25 Edinburgh - Dundee was worked on 30th. Photograph courtesy Roger Geach collection. A work worn 25076 at Eastfield on May 15th 1982. An Inverness - Perth relief was worked on June 18th whilst the next day (19th) it was the turn of a Glasgow Queen Street - Dundee. During October 25076 was transferred to Kingmoor which would be its last transfer. The following month - November - 25076 noted at Derby Works with minor cab damage. Photograph courtsey Adrian Healey A pair of Class 25s, led by 25076 and both with collision damage await entry into Derby Works November 8th 1982. A rescue job took place on July 1st with 25076 & 25196 assisting the 07.50 Manchester Victoria - Glasgow Central from Oxheyes back to Preston following the failure of 87008. On July 12th 25076 & 25184 worked a morning Bestwood Park - Garston Dock coal train. The next two recorded workings involved Cambrian line trains. On August 13th 25076 & 25083 worked the 10.10 Euston - Aberystwyth from Birmingham New Street returning with the 17.15 Aberystwyth - Shrewsbury. On August 27th Nuneaton stabling point included 25076, 25321, 31162/69/91 & 31311, the Class 31s were clearly taking over. On September 3rd 25076 & 25229 worked the 07.35 Euston - Aberystwyth from Wolverhampton to Sutton Bridge Junction where 25229 failed with both locomotives replaced by 25119 & 25234. On November 7th 25076 worked the 08.01 Crewe - Cardiff. 1984 opened with an unusual working, on January 13th 25076 handled the 07.05 Hereford - Paddington. The next day (14th) 25076 was noted at Severn Tunnel Junction depot. February 1st saw 25076 work the 18.05 Euston - Blackpool North forward from Preston. A diesel multiple unit failure on April 13th found 25076 working the 19.35 Derby - Crewe. An unusual working on May 1st saw 25076 & 25176 on a Lackenby – Scunthorpe special. The return leg of 'The Ten Counties' railtour on May 12th was worked from Walsall to Marylebone by 25076 & 25245. On May 21st 25076 & 25205 worked the evening Tees - Bescot Speedlink. Three Cambrian line roundtrips followed, on May 26th with 25064, June 2nd with 25189 and June 16th with 25205. On June 23rd the 10.10 Euston - Shrewsbury was worked forward from Wolverhampton by 25076 & 25058. A diesel multiple unit failure on July 3rd saw 25076 work the 17.20 Derby - Lincoln Central and the 20.35 Lincoln Central - Crewe to Derby. On July 12th 25207 & 25076 handled the well loaded 6V32 14.56 Ellesmere Port - Severn Tunnel Junction freight. The final recorded passenger working for 25076 took place on September 16th working the 04.00 Crewe - Chester. 25076 was withdrawn on November 12th possibly due to a fire in vicinity of the steam generator, with a scorched bodyside panel. No.1 cab 2nd man's side: bent handrail below cab window: April 1974 - May 1984 (until withdrawn?). Page added August 3rd 2013.